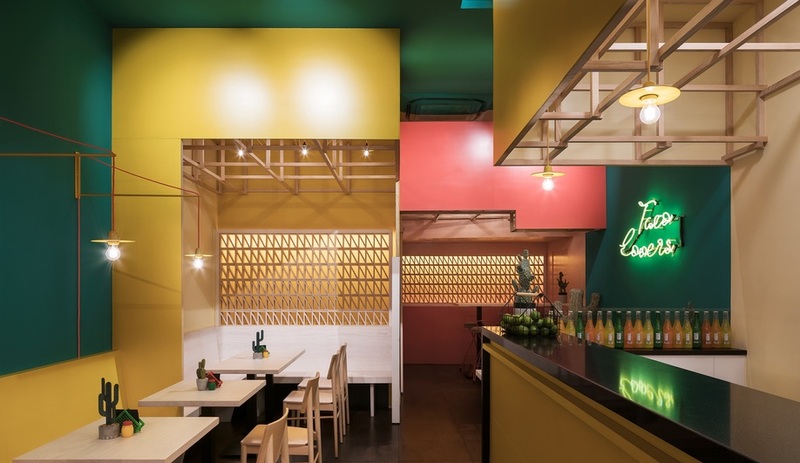 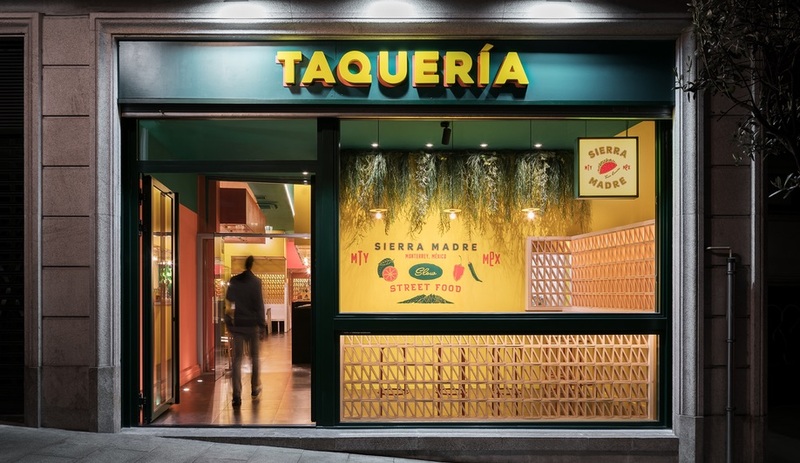 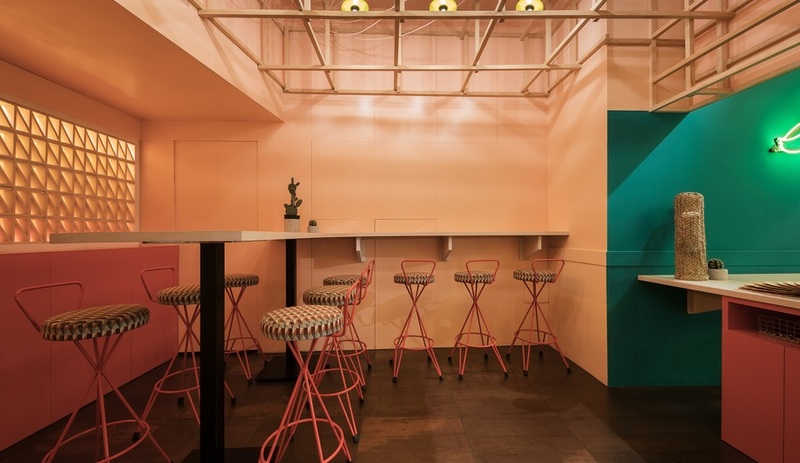 In Vigo, Spain, Erbalunga Estudio plays with colour and depth perception to bring an authentic Mexican feel to local taco shop Sierra Madre. 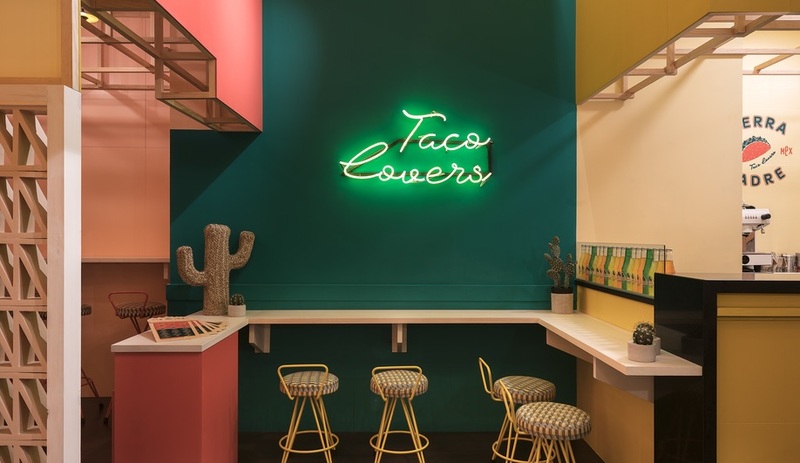 For the owners of Sierra Madre Taquería, authenticity is key – for both the food it dishes out and for the space in which it operates. 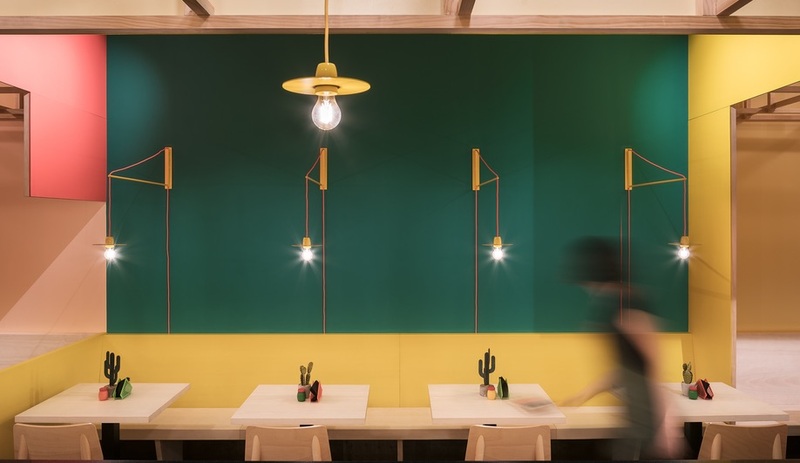 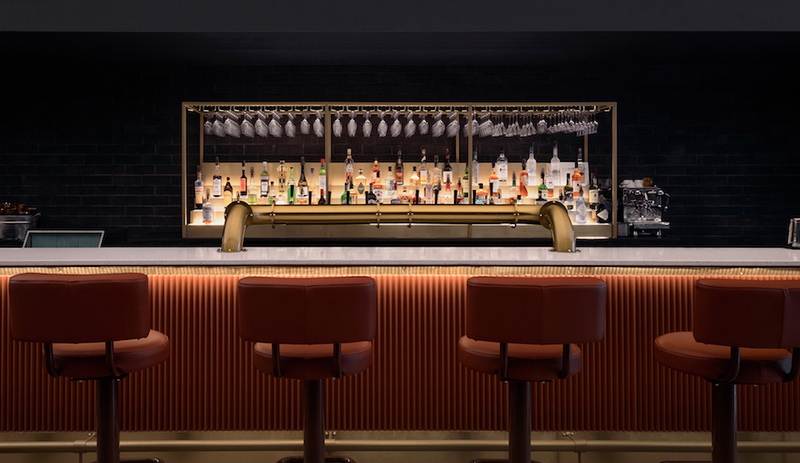 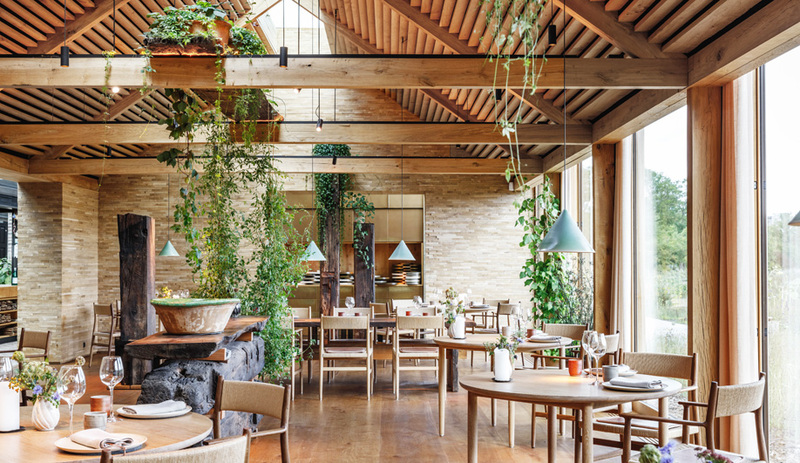 Located in Vigo, Spain, the eatery is far from the northwestern region of Monterrey, Mexico, where the robust flavours of its cuisine come from, but with the help of local firm Erbalunga Estudio, the restaurant feels traditionally urban-inspired. 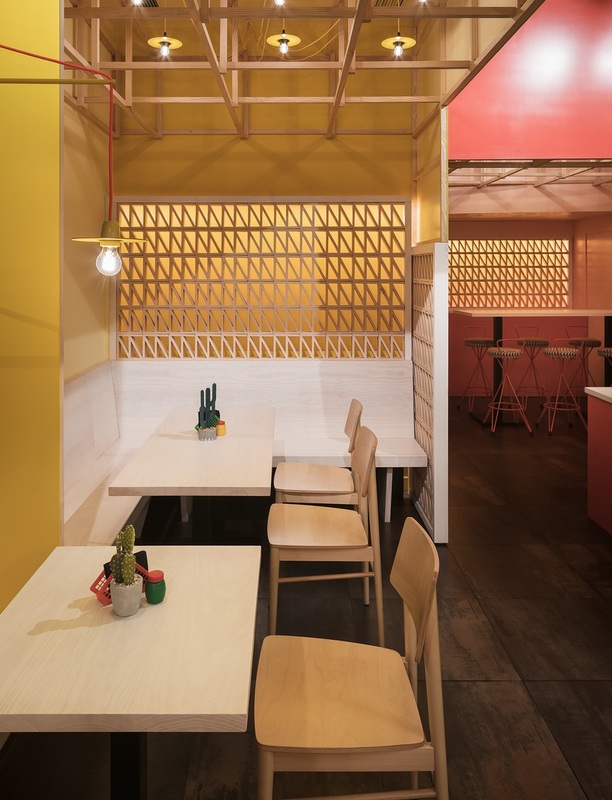 To bring the vibrancy of a bustling street-food market into the 103-square-metre restaurant, Erbalunga Estudio devised a layout that uses volumes that descend from the ceiling to create a staggered sightline from the street, mimicking the effect of corners and intersections; they also imply that the height of the space is more than it is. 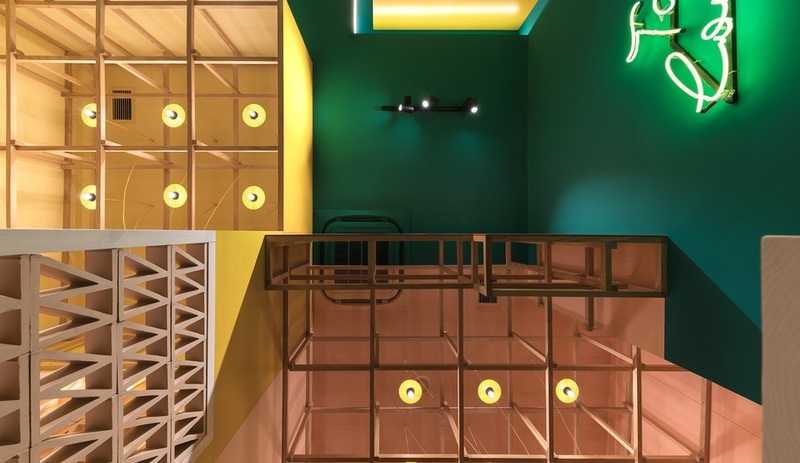 Made of MDF panels, these boxes were left free of ornamentation and lacquered in one of three energetic shades: olive green, mango yellow and deep salmon pink. 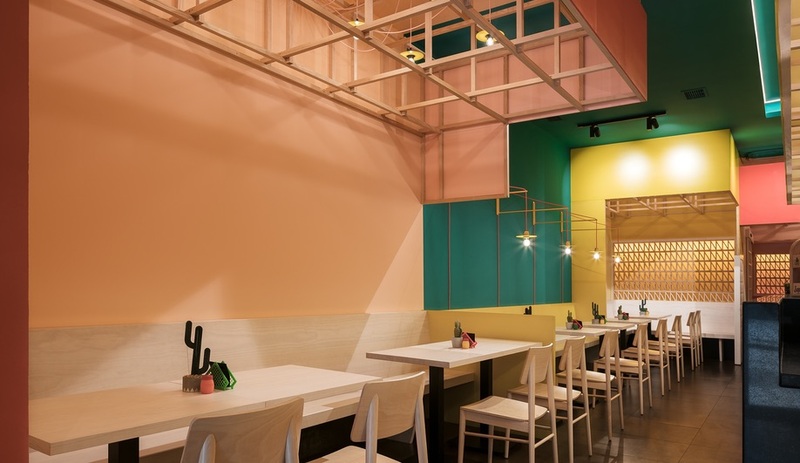 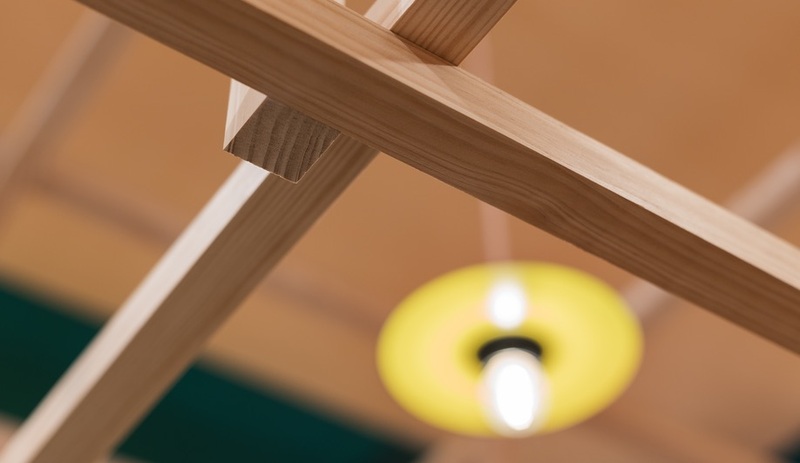 The wood Espino Vera is referring to is natural pine, and it was used to build a series of open-grid installations that drop from the ceiling within the colourful boxes. 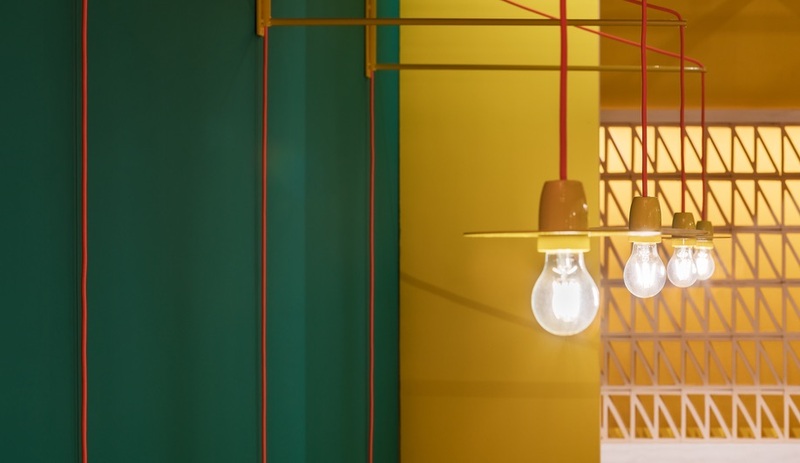 Representing a “continuation of the street,” the frameworks have an appropriately ad hoc appearance and are strung with industrial-style lights with exposed cords and bulbs. 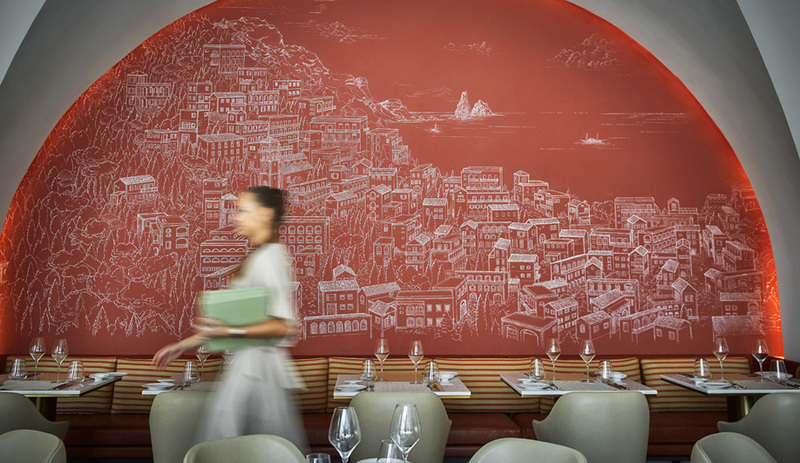 To add in texture and another layer of visual interest, Erbalunga inserted screens made from triangular pieces of baked clay into portions of some walls. 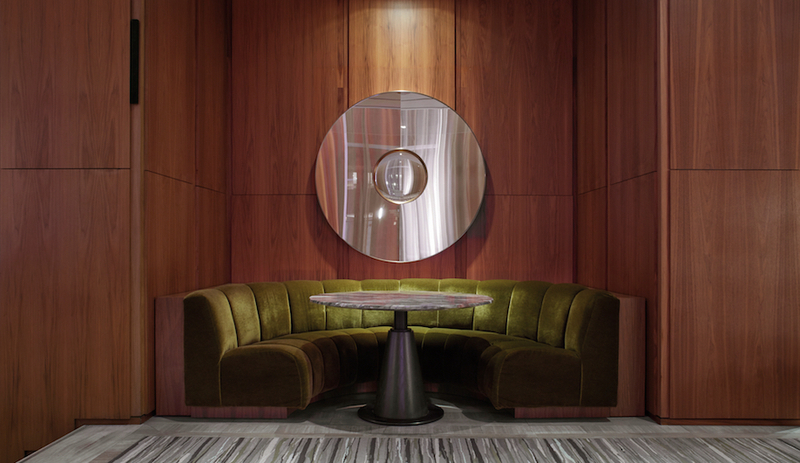 The geometric partitions slightly obscure views while letting light and shadows pass through, upping the energetic vibe. 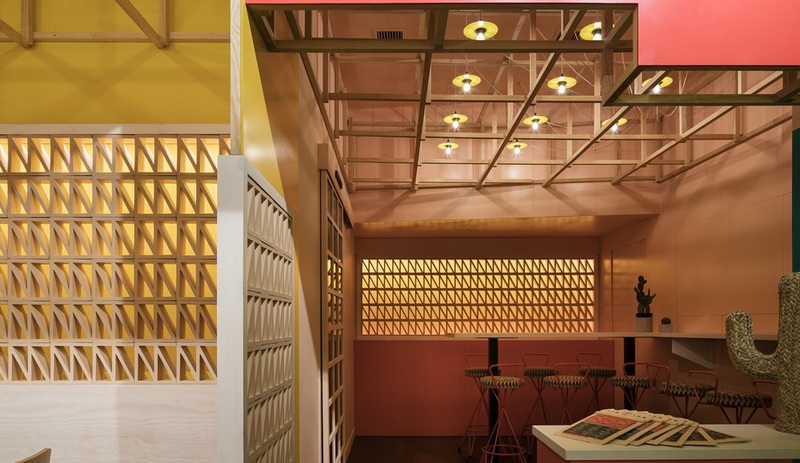 With seating for up to 40, arranged as tables for two or four, a semi-private booth for slightly larger groups and casual bar-height counters with stools for cocktails and appetizers at both the front and back, Sierra Madre has turned out a restaurant that welcomes diners to linger over its authentic “slow food” as much as its stylish setting.